The Moon was a focal point for NASA in 2017, whether it was blocking out the Sun during one of the most-viewed events in U.S. history, or reinvigorating the agency’s human space exploration plans. But the Moon has always been a focus of humanity's imagination. This false-color image composed of 15 images taken through three color filters by NASA's Galileo spacecraft, as it passed through the Earth-Moon system on Dec. 8, 1992. When this view was obtained, the spacecraft was 262,000 miles, or 425,000 kilometers, from the Moon and 43,000 miles (69,000 kilometers) from Earth. The false-color processing used to create this lunar image is helpful for interpreting the surface soil composition. 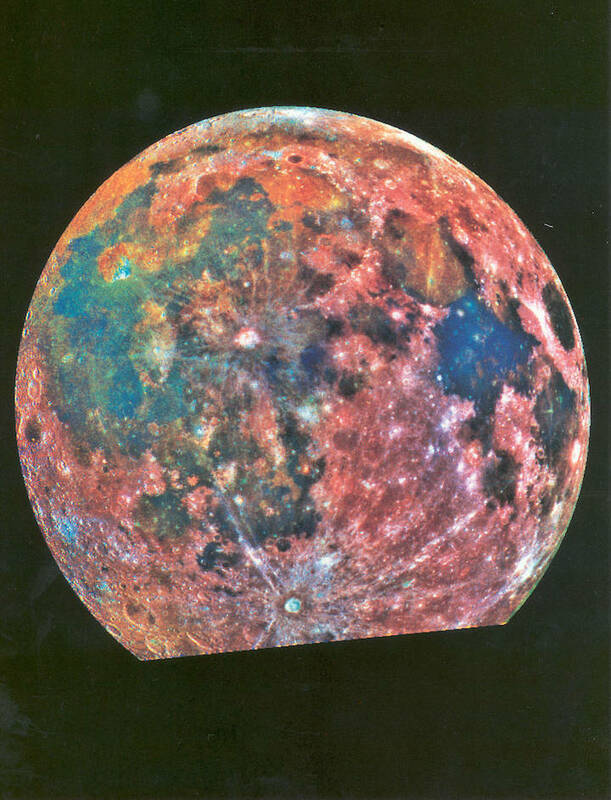 Areas appearing red generally correspond to the lunar highlands, while blue to orange shades indicate the ancient volcanic lava flow of a mare, or lunar sea. Bluer mare areas contain more titanium than do the orange regions.